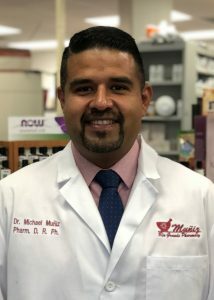 (HARLINGEN) – It was in 1996 when Michael Muniz first stepped foot in Texas State Technical College as a computer maintenance major, but after some soul-searching, Muniz grew up to be a pharmacist. He will share his wisdom and experiences with TSTC graduates next Friday as the Summer 2018 commencement speaker. Muniz was selected as commencement speaker because of his alumni status and the success he has found since he graduated from the college — even though his life took him in a different direction from his initial plan. At age 13, Muniz started building computers, but when he enrolled in computer maintenance classes at TSTC, the subject was no longer exciting to him. So he changed majors and chose chemical technology, but it still did not give him joy. After six years, a job at FedEx and working as a medical billing clerk for a local surgeon, Muniz decided to pursue surgical technology at TSTC, earning a certificate in 2004. Of course, for Muniz, life happened. And with a wife and three children, he knew medical school was not an option. So after tutoring students from the pre-pharmacy program at the University of Texas at Brownsville (now University of Texas Rio Grande Valley), where he also graduated with a bachelor’s degree in biology and chemistry, he decided to pursue pharmacy school. He earned a Doctor of Pharmacy degree from Texas A&M University-Kingsville in 2012 and completed a metabolic and nutritional medicine fellowship through George Washington University. Muniz, who also has been a guest speaker for surgical technology pinning ceremonies, said he hopes to pass a message of hope and encouragement that will invigorate TSTC graduates and current students to keep pursuing their goals and dreams. While Muniz still practices as a pharmacist at his uncle’s pharmacy, Muniz Rio Grande Pharmacy in Harlingen, he is also opening his own shop: Krave Market, a one-stop health-food market for people living on ketogenic, paleo, gluten-free or Whole30 diets. Muniz said he hopes to continue serving TSTC students through guest lectures and speaking engagements.